Visit Dandridge, Tennessee’s second oldest town, and stroll down the sidewalks through history! Historic Dandridge bears the distinction of being the only town in the United States name after Martha Dandridge Washington, wife of our first President, George Washington. In 1783, thirteen years before Tennessee became a state, the first permanent settlers were attracted to the Dandridge area by the French Broad River and a good spring, around which the town was laid out. By 1792, the settlement had grown to such an extent that Governor William Blount designated the new county of Jefferson in the Territory South of the Ohio River. Francis Dean, a wealthy landowner, gave fifty acres for Dandridge, which became a county seat. Travelers arriving by the stage route and by steamboats on the French Broad River frequently stayed over in Dandridge. As a result, early taverns and inns were abundant. Four of these early taverns still exist today. The greatest modern influence on Dandridge was the creation of Douglas Lake, a TVA project, which threatened to flood the town in the early 1940’s. To save the town, a million-dollar dike of native stone set in tons of solid earth was built to hold back the waters of the new lake. 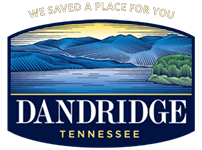 Dandridge has an abundance of historic buildings, the majority of which date back to the early to mid 1800’s. Shepard’s Inn, 1814 – Presidents Andrew Jackson, James K. Polk, and Andrew Johnson stayed in the popular resting and eating spot for stage coach travelers. Stepping blocks for ladies in the located in the front. Originally, this was a two-story log house. Shadrach Inman added the frame exterior in ca.1823. Roper Tavern, 1817 – This Federal style brick structure was built by Col. John Roper and served as an early stage coach stop. Hickman Tavern, 1820 – A beautiful circular staircase winding to the third floor is the highlight of this Federal style structure bought by the Fain family; later occupied by James Hickman, who built the courthouse. The former tavern now serves as the Dandridge Town Hall. Visitors are welcome to look around. Vance Building, 1823 – A Federal, three-bay brick structure with archways and transoms has served as home of the first Dandridge Telephone Exchange, post office, J.W. Vance Furniture and Funeral Parlor, Harris General Merchandise. Recently the building underwent certified historic restoration. Thomas Tavern, 1843 – James Mitchell built this early tavern and boarding house on a lot purchased from Hopewell Presbyterian Church after the church relocated. It features a double pen style used in log construction from 1780 to 1830. It now serves as the Thomas Tavern Smoke and Gift Shop. And Many More! In all there are over 20 significantly historic structures in the Downtown District alone. Come and take the Dandridge Walking Tour to experience the history in person. As you walk into the Revolutionary War Graveyard you will be entering the birthplace of Dandridge and Jefferson County, for it is here that the first commissioners of the newly formed county of Jefferson met and chose this spot for the county seat in January of 1793. The old stone path leading from the steps crossed this plot of land to the oldest church in Jefferson County, Hopewell Presbyterian Church, which was organized in 1785 by the brave and religious Scots-Irish in a log building that stood for near the north side of the graveyard called Francis Dean’s or Robert Henderson’s Lower Meeting House. Francis Dean owned the land and the Rev. Robert Henderson was the first pastor of the church. To the rear of the graveyard a clear path wound down the hill to a clear, cool spring where the pioneer could quench his thirst after a long ride on horseback to attend services at the little log church in the wilderness.